Educreations - All about apps in YOUR classroom! 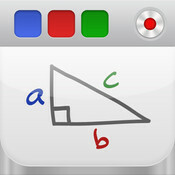 Educreations is an exciting app that transforms your iPad into a recordable whiteboard. It records your voice, handwriting and also allows you to insert pictures to produce your own personal video lessons that you and your students can share online. Your lessons are stored online and can be accessed by students on any computer or iPad. It is easy to use, so it makes a great tool for assessing student knowledge. Putting this app in the hands of your second language learners will give assessment a whole new meaning. Students can create projects that apply to every level of Bloom's Taxonomy verbally and through illustrations. Using Educreations, students can create a movie poster to advertise a story. They can create a new product related to the story. Characters can be reconstructed to create new endings to the story. Students can write and perform the inner dialogue of a character in the story at a particular point in the story or write and perform the lyrics of a song the main characters would sing if they became a singer. Students can construct the setting for a story. In the Language Arts class, students can use media to defend the position of a character in the story from the characters point of view. Students can judge the theme of stories by evaluating it based on personal opinion. In math, present the students with a completed math problem and allow them to judge whether a correct solution was found. Using a released test question, have the students defend their solution. Educreations in the Language Arts class can be used to distinguish between different elements of various genres. Students can compare and contrast between characters in a story or characters in different stories. In science, students can distinguish the steps in the scientific process through experiments of their own. Students can compare different animals (seal and sea lion) or anything else one can put in a double bubble map. In the math class, students can create graphs to differentiate between sets of data. In the Language Arts classroom, students can use Educreations to dramatize . Students can interpret how a character would respond in a different setting. In the science class, students can classify plants, animals or states of matter. They can begin a scientific journal where they sketch or illustrate the steps to their science fair project. In the math class, students can demonstrate the steps to any math concept. in Social Studies students can dramatize or illustrate historical events. Using Educreation in the science class, when given a picture of the solar system, students can identify the planets. When given a picture of a plant, they can identify the parts of a plant. Students can explain the steps to the scientific process. Using pictures, students can explain the life cycle of an animal, the rock cycle or the water cycle. In the Language Arts class, students can write vocabulary words and locate a picture to show the meaning. Students can use pictures of a story to explain selected ideas from the story in their own words. In the same way, they can predict what could happen next in the story before reaching the end of the story. Students can paraphrase the events in a story. Students can use Educreations in the Language Arts class to record themselves repeating and listing their spelling words as they write them down. Students can state the name of characters in a story from pictures of the characters. They can also reproduce the setting using pictures of their own. Lists of different parts of speech can be created (verbs, nouns, etc.). In the math class students can recall prime numbers aloud as they choose them from a list. They can also reproduce their own flashcards in written and verbal form for later playback. Students can use a circle map to define in writing and verbally. Email Karen Foerch with any questions you have about how to use this app in your class, or if you would like more specific suggestions for how you can use this app in your content area. Here's some more helpful hints to help you get going with Educreations. Here is an example of student work. The student is defining parrallel and intersecting lines. Although this is an example of a teacher at work, the same picture can be given to the student to retell or paraphrase the information.